On our very first trip to Florence we were lucky to stumble upon the wonderful Mercato Centrale, the city’s premier food market. Considering we didn’t even know it existed, we felt like we had made the discovery of the century. I could spend hours in here browsing the many food stalls, but for J., there’s only one destination that he really cares about-Nerbone. Tucked into a corner of the market near one of the entrances, you’ll recognize this place by the crowd standing in front of the counter, trying to pay and place their order. Nerbone has been around since 1874 and has been serving cucina povera to the hungry workers of the neighborhood since then. Now in addition to the locals you’ll be elbowing tourists trying to make your way to the front of the line. This eatery is famous for their panino bollito (boiled beef sandwich with two very tasty toppings) but there are a variety of other dishes from pasta, to porchetta, to meat and potatoes, changing from day to day. On our very first visit J. ordered one of the specials which was a white bean ragout with sausage. He was almost in some kind of food induced trance, savoring each and every bite. He’s been lucky to stumble on this dish on subsequent visits, but what about in between trips to Florence? On returning home form Italy a few weeks ago I decided to once again try to recreate J’s food memory. I have made it before, but this attempt was probably my best effort. 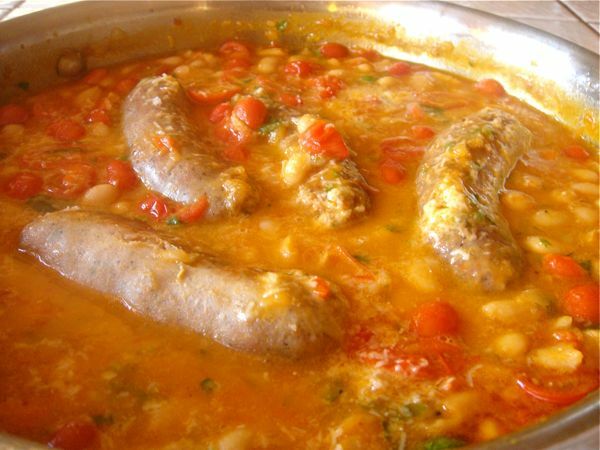 I saw a recipe in the May issue of Bon Appetit for White Bean Ragout With Toast and threw in some Italian sausage. It was pretty darn good if I must say so myself, and I think J. would back me up. Pulse onions in a food processor until finely chopped but not puréed (you should have about 2 cups). Transfer to a medium bowl. Pulse bell pepper in processor until finely chopped but not puréed (you should have about 1 cup); add to bowl and mix well. Meanwhile, preheat oven to 375°F. Rub bread slices with cut sides of remaining garlic clove. Place bread on a baking sheet and sprinkle 1 tablespoon Parmesan over each slice. Toast until cheese begins to brown, about 5 minutes. Set aside. Heat reserved 1/2 cup soffritto and beans in same skillet over medium-high heat. Cook, stirring often, until heated through, about 1 minute. Stir in 3 cups broth; bring to a boil. Simmer, scraping up browned bits, until liquid is slightly thickened, 3-4 minutes. Add tomatoes and remaining 1 cup broth; simmer until tomatoes are tender, 3-4 minutes. Stir in 2 tablespoons Parmesan. Season with salt and pepper. I cooked a few links of Italian sausage with fennel in a 350 degree oven for about 20 minutes and then put them into the ragout after I added the broth and let them simmer for the remainder of the time in the recipe. Divide bread among bowls. Top with some bean mixture and broth. Garnish with remaining 2 tablespoons Parmesan and parsley. Drizzle with oil, if desired. Leave me a comment before Friday night June 1st to be entered to win a copy of The Southern Italian Farm Table. Ahh, the ragout I’m positive is a winner, for sure I’ll be making it soon, thanks for sharing it with us. 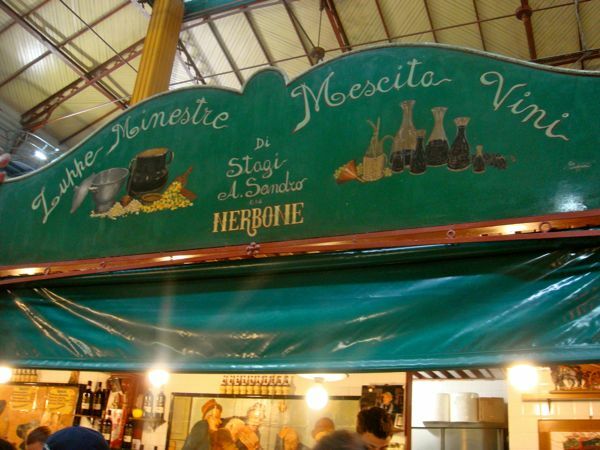 Nerbone is my kind of place, though I’ve never been there I have visited similar stores from the north, center and south of Italy (include Sicily) and well know the temptation to spend a whole day wondering around impulse buying, I’ve received many fine recipes from vendors in stores as such. Gian-you are welcome. I have to make it again soon-I didn’t get enough! My kind of comfort food. Defiantly will try this recipe. Oh how I wish I was going to Florence this year. V Girl-I hear you! Next year maybe? O yes. Nerbone. Mmmmm. I love that place. Great people watching around the bar and the panini sono buonissimi. With a mini glass of red even better! Your version of the ragout looks absolutely delicious! Janine-I am having such Italy withdrawal!!! This sounds DELISH! On my must make list! Thank you! Gina-it really was delicious-even without the sausage it’s a great dish.